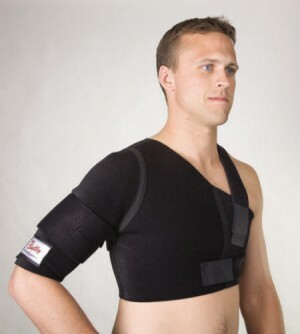 Traditional shoulder braces have forced you to sacrifice either stability or function. Now you can have both! On the outside, elastic straps attach with hook to the neoprene at any point, in any direction, and with any amount of force you choose. You can functionally stabilize, assist or restrict movement according to the specific needs of each athlete. On the inside, the perforated, breathable, rubber-like neoprene grips the skin so the support moves with the athlete. It’s as if the stabilization straps are attached directly to the body. Worn by professional and amateur athletes in all sports.